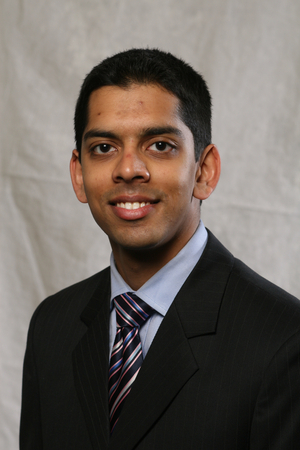 Posted on Wed, Oct 20, 2010 : 2:25 p.m.
Sujal Parikh accomplished more by his fourth year of medical school than many people do in their entire lives, said Elizabeth Petty, University of Michigan associate dean of medical school education. "Sujal was one of the most generous and compassionate, bright young men I've ever met. ... He was dedicated to making the world a better place," Petty said. "He had already accomplished more than many of us have in our entire lives." Sujal Parikh, a fourth-year University of Michigan Medical School student, died Oct. 12 while in Uganda, where he was doing AIDS research. Parikh, a 25-year-old U-M Medical School student, died Oct. 12 from injuries suffered in a motorcycle taxi accident in Kampala, Uganda. Petty said he was doing AIDS research there and had been to the country multiple times before. "He was at a hospital with a neurosurgeon. ... They were doing the kinds of things that we would do, but the injuries were just too severe for him to survive," she said. Parikh was writing a blog while in Uganda, detailing his experiences there. He was born February 22, 1985, in Dallas, Texas. He received his undergraduate degree in public health and neurobiology from the University of California, Berkeley. "He was very passionate about global health initiatives and social justice issues," Petty said. "(His death is) a great loss for us in our medical school family, but I think it's a great loss in terms of global, medical health." Manoj Parikh said his son had been motivated since he was a child. He recalled Sujal saying after his first cub scout meeting, "Dad, I'm going to be an Eagle Scout and I'm going to finish Eagle Scouts by the ninth grade." That was just one of many goals he would accomplish, his father said. "He was focused on what he wanted to do in his life and he was compassionate and loving and caring," Manoj Parikh said. "I learned so many things from him." Manoj Parikh said his son developed a passion for public health while volunteering as a counselor at a Berkley clinic. His philosophy was to put people first. "He asked, 'Why can't we treat the patient first and worry about the money or payment later on?'" Manoj Parikh said. Petty said Sujal Parikh was a student leader and had many friends in the United States and abroad due to his involvement in various groups addressing human rights and global health care disparities. Among them were the Student Advisory Board for Physicians for Human Rights, Student Advisory Committee for the Global Health Education Consortium, American Medical Student Association's AIDS Advocacy Network Steering Committee, and the Uganda Village Project board of trustees. He was also the associate editor-in-chief and a writer for Global Pulse, the AMSA International Health Journal. "He really knew how to connect to people," Petty said. "He was very generous with his time and his energy. ... He wasn't afraid to tackle the most challenging problems." Dipa Joshi, a fourth-year U-M medical student, was a close friend of Sujal Parikh's, who she calls 'Suj.' When asked whether she had a favorite memory of him, she paused, and after a moment said, "I have so many." "A lot of memories with Suj are ... mainly of us just hanging out," she said. "He would go out with the best of us, he would stay out late and still get up early for rounds." Joshi said Sujal Parikh was adventurous and loved to travel and was well-respected by those who knew him. "Most people would say ... he's the guy who's going to do great things for the world," she said. "He was the guy we were going to see on TV 20 years from now and say 'I was friends with that guy. I went to med school with that guy.'" She added, "The last time I saw Suj was right before he left to travel around the States before leaving for Uganda (this summer). ... Luckily we saw him the day before he left." Manoj Parikh said Sujal Parikh read a biography of Gandhi at an early age and was inspired by him. As for his thoughts on life and death, Manoj Parikh recalls his son once saying, "(When a man dies) nobody is going to remember what religion he had, or how much wealth he accumulated ... all that's going to count is what that person did for the common man and that will be that person's legacy." Manoj Parikh said it was his son's wish to donate his body to science. Heather Lockwood can be reached at heatherlockwood@annarbor.com. Thu, Oct 21, 2010 : 2:19 p.m.
Sujal will be missed by so many. The entire Medical School community is mourning the loss of an amazing student and an amazing young man. Though his journey was short, his accomplishments were far from that. He has touched so many, and I know his legacy of humanitarian acts will carry on by the many people he touched. Thu, Oct 21, 2010 : 5:47 a.m. Wed, Oct 20, 2010 : 6:06 p.m. I do not like it when the good people die. I do not understand it. God has a purpose but we will never understand. Peace to everyone who knew him and his family. I do not know him but wish I did know him. Wed, Oct 20, 2010 : 4:58 p.m. Thank you for the link to Mr. Parikh's blog - very inspiring for others. A tragic loss. Wed, Oct 20, 2010 : 4:23 p.m. The world has lost a great humanitarian. My thoughts are with his family and friends. Wed, Oct 20, 2010 : 3:43 p.m. I wished I would have known him. So very sad to lose someone of his quality. Wed, Oct 20, 2010 : 3:31 p.m. It's been a tragic year for UofM. A lot of students dying in traffic accidents. Wed, Oct 20, 2010 : 2 p.m.
well said djm12652. There is nothing I can add. Wed, Oct 20, 2010 : 1:50 p.m.
A bright star on our world's horizon has disappeared...so sad. My thoughts are with his parents and family. I cannot fathom the pain at burying my child. God speed.